For scientists, supernovae are true superstars -- massive explosions of huge, dying stars that shine light on the shape and fate of the universe. For a brief burst of time, supernovae can radiate more energy than the sun will emit in its lifetime. With the potential energy of 25 hundred trillion trillion nuclear weapons, they can outshine entire galaxies, producing some of the biggest explosions ever seen, and helping track distances across the cosmos. 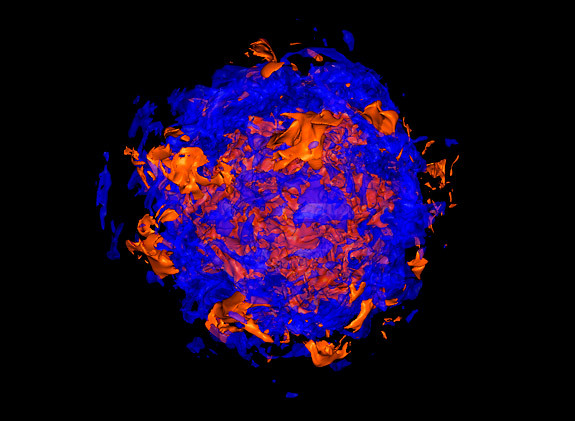 Now, a Princeton-led team has found a way to make computer simulations of supernovae exploding in three dimensions, which may lead to new scientific insights. Even though these mammoth explosions have been observed for thousands of years, for the past 50 years researchers have struggled to mimic the step-by-step destructive action on computers. Researchers argue that such simulations, even crude ones, are important, as they can lead to new information about the universe and help address this longstanding problem in astrophysics. The new 3-D simulations are based on the idea that the collapsing star itself is not sphere-like, but distinctly asymmetrical and affected by a host of instabilities in the volatile mix surrounding its core. "I think this is a big jump in our understanding of how these things can explode," said Adam Burrows, a professor of astrophysical sciences at Princeton, who led the research. "In principle, if you could go inside the supernovae to their centers, this is what you might see." Writing in the Sept. 1 issue of the Astrophysical Journal, Burrows -- along with first author Jason Nordhaus, a postdoctoral research fellow at Princeton, and Ann Almgren and John Bell from the Lawrence Berkeley National Laboratory in California -- reports that the Princeton team has developed simulations that are beginning to match the massive blow-outs astronomers have witnessed when gigantic stars die. In the past, simulated explosions represented in one and two dimensions often stalled, leading scientists to conclude that their understanding of the physics was incorrect or incomplete. This team used the same guiding physics principles, but used supercomputers that were many times more powerful, employing a representation in three dimensions that allowed the various multidimensional instabilities to be expressed. "It may well prove to be the case that the fundamental impediment to progress in supernova theory over the last few decades has not been lack of physical detail, but lack of access to codes and computers with which to properly simulate the collapse phenomenon in 3-D," the team wrote. "This could explain the agonizingly slow march since the 1960s toward demonstrating a robust mechanism of explosion." Supernovae are the primary source of heavy elements in the cosmos. Their brightness is so consistently intense that supernovae have been used as "standard candles" or gauges, acting as yardsticks indicating astronomical distances. Most result from the death of single stars much more massive than the sun. As a star ages, it exhausts its supplies of hydrogen and helium fuel at its core. With still enough mass and pressure to fuse carbon and produce other heavier elements, it gradually becomes layered like an onion with the bulkiest tiers at its center. Once its core exceeds a certain mass, it begins to implode. In the squeeze, the core heats up and grows even more dense. "Imagine taking something as massive as the sun, then compacting it to something the size of the Earth," Burrows said. "Then imagine that collapsing to something the size of Princeton." What comes next is even more mysterious. At some point, the implosion reverses. Astrophysicists call it "the bounce." The core material stiffens up, acting like what Burrows calls a "spherical piston," emitting a shock wave of energy. Neutrinos, which are inert particles, are emitted too. The shock wave and the neutrinos are invisible. Then, very visibly, there is a massive explosion, and the star's outer layers are ejected into space. This highly perceptible stage is what observers see as the supernova. What's left behind is an ultra-dense object called a neutron star. Sometimes, when an ultramassive star dies, a black hole is created instead. Scientists have a sense of the steps leading to the explosion, but there is no agreed upon fundamental process about what happens during the "bounce" phase when the implosion at the core reverses direction. Part of the difficulty is that no one can see what is happening on the inside of a star. During this phase, the star looks undisturbed. Then, suddenly, a blast wave erupts on the surface. Scientists don't know what occurs to make the central region of the star instantly unstable. The emission of neutrinos is believed to be related, but no one is sure how or why. "We don't know what the mechanism of explosion is," Burrows said. "As a theorist who wants to get to root causes, this is a natural problem to explore." The scientific visualization employed by the research team is an interdisciplinary effort combining astrophysics, applied mathematics and computer science. The endeavor produces a presentation through computer-generated images of three-dimensional phenomena. In general, researchers employ visualization techniques with the aim of making realistic renderings of quantitative information including surfaces, volumes and light sources. Time is often an important component, contributing to making the images dynamical as well. To do their work, Burrows and his colleagues came up with mathematical values representing the energetic behaviors of stars by using mathematical representations of fluids in motion -- the same partial differential equations solved by geophysicists for climate modeling and weather forecasting. To solve these complex equations and simulate what happens inside a dying star, the team used an advanced computer code called CASTRO that took into account factors that changed over time, including fluid density, temperature, pressure, gravitational acceleration and velocity. The calculations took months to process on supercomputers at Princeton and the Lawrence Berkeley Laboratory. The simulations are not an end unto themselves, Burrows noted. Part of the learning process is viewing the simulations and connecting them to real observations. In this case, the most recent simulations are uncannily similar to the explosive behavior of stars in their death throes witnessed by scientists. In addition, scientists often learn from simulations and see behaviors they had not expected.